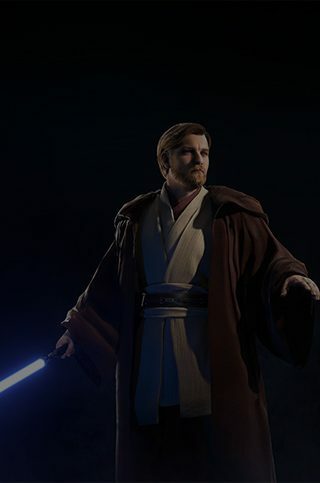 Obi-Wan Kenobi* is coming to Star Wars™ Battlefront™ II on November 28 with the Battle of Geonosis update**. Today, we’re focusing on the cherished Jedi Master, but if you want an early look of Geonosis as well, we recommend reading up on our fresh interview with DICE’s Senior Level Designer Peter Vesti Frendrup. 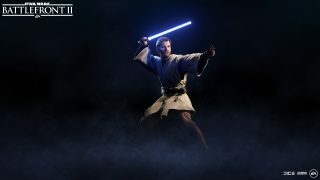 How will Obi-Wan Kenobi play in Star Wars Battlefront II? What are his Abilities? What different Appearances will he slip into? We’re serving the essentials to you below – and make sure to dive in and read the latest Community Transmission to learn even more. 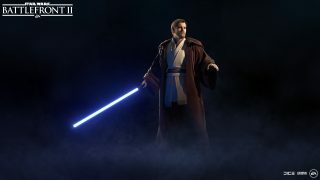 Star Wars Battlefront II’s Obi-Wan Kenobi in his default Jedi Master Appearance. The legacy of the fabled Jedi Master transcends eras. He was a member of the Jedi Council, a general for the Galactic Republic, and later, after spending years in exile, mentor to Luke Skywalker. Of course, Luke wasn’t the first Skywalker taken under Kenobi’s wings, as Obi-Wan trained and fought alongside his father Anakin Skywalker (coming to the game this February) during the Clone Wars. And it’s primarily this chapter of his life that’s inspired Obi-Wan’s representation in Star Wars Battlefront II. A master of defensive lightsaber combat and usage of the Force, he was also a constant thorn in General Grievous’ side. The Clone Wars animated series veterans Matthew Wood (Grievous) and James Arnold Taylor (Obi-Wan) are voicing the arch-nemeses, accentuating the history between the two. Make sure to read our interview with both to learn more. And, as previously covered in our walk-through of how we’re bringing the heroes and villains of Star Wars to life, we’re aiming for the likenesses of their real-life actors. As such, we’ve modelled Obi-Wan Kenobi after Ewan McGregor’s portrayal in Star Wars™: Episode III – Revenge of the Sith™. Catering to these known traits and characteristics, we hope that players will feel right at home playing as the Jedi Master in Star Wars Battlefront II. Now, even though our hero isn’t arriving until November 28, knowledge is power. So, use the intel below to prepare your mind and strategy. Obi-Wan Kenobi wearing the Robed Appearance***. The noble man arrives with the default Jedi Master Appearance. The Robed Appearance*** will also be available for purchase with Credits or Crystals on November 28. A nod to his time as commander of the 212th Attack Battalion, the General Kenobi Appearance*** will also be available for Credits or Crystals at a later date. We’re excited to get Obi-Wan Kenobi into players hands and to see him clashing with General Grievous and the other feared villains, starting November 28.